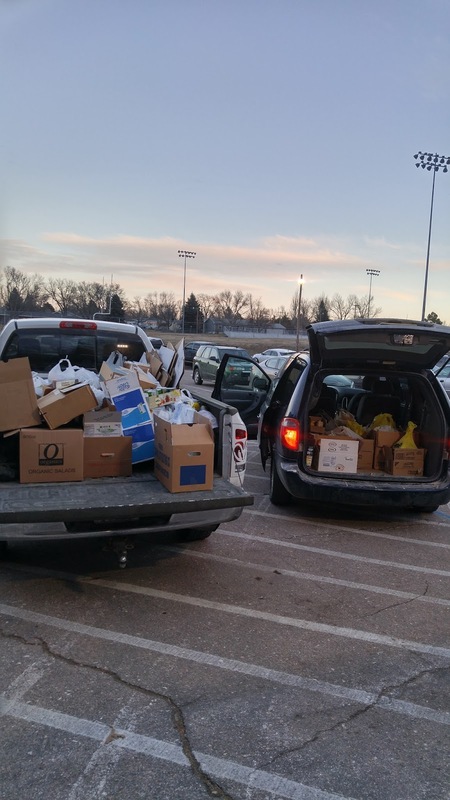 Chadron Middle School completed it's annual Caring for Sharing Food Drive on Friday, December 11th. We had another successful campaign, brining in nearly 2,300 non-perishable food items. All items were donated to the Northwest Community Action Partnership food pantry. The 6th grade class collected 1015 non-perishable items, which was enough to win the class competition. By winning the competition, 6th grade students earned the opportunity to compete against the CMS faculty and staff in our 3rd Annual "Nothing but Net" games. The games will take place in the afternoon of December 23rd, our last day of school. Students will meet in the gym at 12:30 for end of quarter awards and the games will immediately follow. Parents are welcomed to come watch. 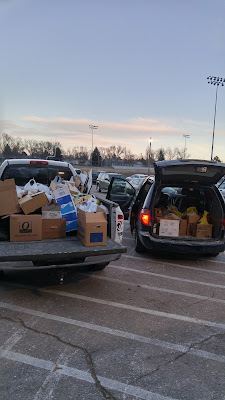 Thank you to everyone who supported the food drive and Chadron Middle School wishes you all a very Merry Christmas and a Happy New Year! Below is a copy of the letter that will be sent home with 5th grade students tomorrow (12/15/15). Chadron Middle School will hold a 5th grade parent meeting immediately following the 5th/6th grade Christmas Program on December 17th in the Chadron High School Commons. The purpose of the meeting is to discuss the 5th grade band class that students will take during the 2nd semester of the 2015 school year. Topics of discussion will include: class goals, instrument rentals and supplies that students will need to participate in band. We will also answer any questions that you have regarding the class. (Norm Martin from Mar Bow Music will also be at the meeting to explain the rental process). We are looking forward to having our 5th grade students participate in band! This is first time that CMS 5th graders have had this opportunity and we hope that having both choir and band experience will enable them to make an informed decision when choosing which music class to pursue next year. We recognize that there will be some wrinkles and we appreciate feedback from students and parents so that we can make adjustments in our future planning. If you are unable to attend the meeting on December 17th, please contact Mr. Dressel so that he can get you the information. Thank you, and we look forward to seeing you at the Christmas program on December 17th. The Upper Niobrara White Natural Resources District is pleased to announce the winners of the 2015 NRD Poster Contest. 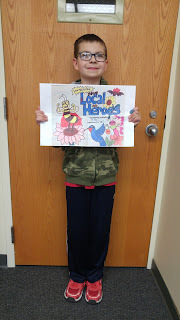 Focusing on the theme “Local Heroes-Your Hardworking Pollinators” the poster contest highlights the educational outreach efforts of the UNWNRD, Nebraska’s Natural Resources Districts (NRDs), as well as the state and national conservation associations and agencies. The contest is part of National Association of Conservation Districts (NACD) Stewardship Week, the longest running celebration of conservation in the country. Thomas Smith and Lucas Riley Ambrose’s artwork advanced to the state competition, where Ambrose took first place statewide for his division as well. Riley’s poster is now entered into the national NACD contest which will be judged at the NACD annual meeting in late January. Each year, the poster contest starts at the local Natural Resources District level. UNWNRD first place winners receive a check for $20, while second place is awarded $10 and this year 131 students submitted entries to the local NRD level. Individuals and teachers from within the Upper Niobrara White NRD which includes Box Butte, Dawes, Sheridan and Northern Sioux Counties may direct questions regarding the local contest to Sheri Daniels 308.432.6190 or daniels@unwnrd.org and state contest questions to Erika Hill 402.471.7672 or ehill@nrdnet.org. 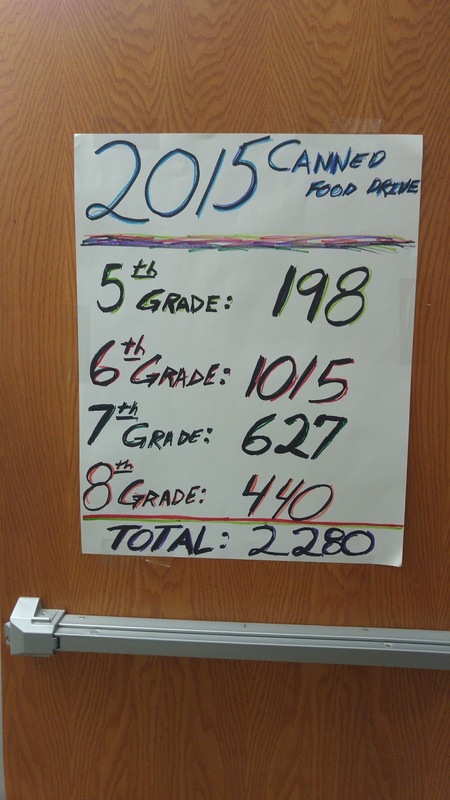 CMS began our annual food drive on November 30th. 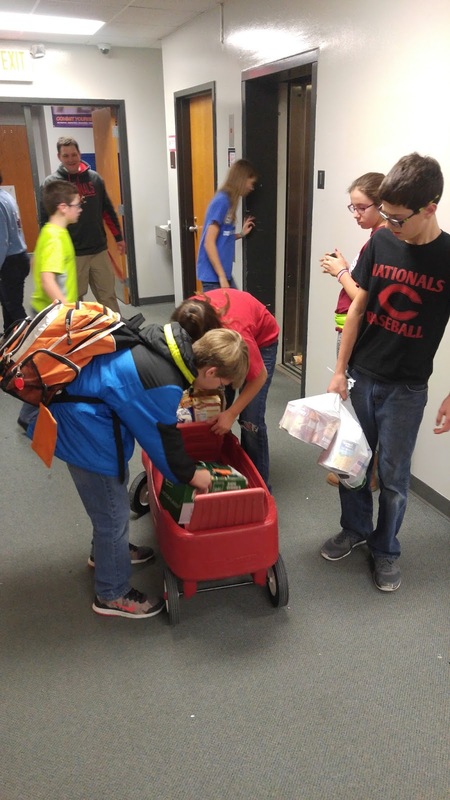 Students from each class are encouraged to bring non-perishable food items to school through December 11th. As in years past, the class that collects the most non-perishable food items will compete against the CMS faculty in the "Nothing But Net" games on December 23rd, the last day of school before winter break. In the past, the games have included ping-pong, basketball, volleyball, badminton, and eclipse ball. The CMS Student Council will decide on the games schedule of events. All food items will be donated to the Northwest Community Action Partnership for distribution to other pantries around the community. We look forward to another successful food drive and we thank the community for their continued support. 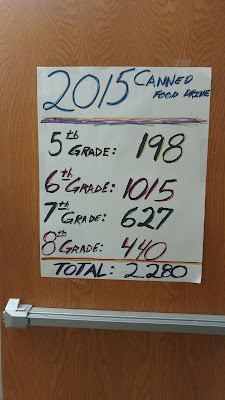 If you have any questions regarding the food drive, please contact Mr. Wollesen or Ms. Smith at 432-0708. 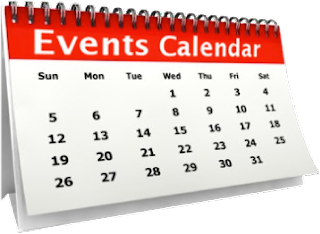 The second mid-quarter ended last Friday, November 20th, 2015. Listed below are a few important dates for parents to keep in mind as we near the end of the semester. Chadron Public Schools held it's first 5th -12th grade vocal music concert of the season on October 29th. All of the students and teachers did an amazing job! The crowd was treated to an hour of song that spanned five decades of popular music. 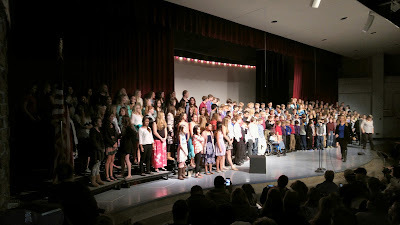 Chadron Middle School students (5th-8th grade) started the night and sang jazz songs that concluded with the "snappy" Duke Ellington classic, "It Don't Mean a Thing (If It Ain't Got That Swing)". The high school choir sang next and their set included Queen's "Bohemian Rhapsody" complete with sign language. The Incredible Cardinal Singers wrapped it up with songs from and inspired by the 1950's. Their set included a medley classics from the movie Grease. For the grand finale, 5th-12th grade students entertained the crowd with Neil Diamond's uplifting classic,"Sweet Caroline" before heading to the commons for ice cream sundaes. Congratulations to the all of the students, Mrs. Mahr, Mrs. Dickerson, Mrs. Chasek, and Mrs. Hastings for a great concert! Thank you to all of the parents and extended family that came out to support the kids. Monday - P.J. Day - "Put Drugs to Bed!" Tuesday - Blast from the Past - "Make Drugs History!" Wednesday - Sports Team Day - "Team Up Against Drugs!" Thursday - - Crazy Day - "Don't Let Drugs Drive You Crazy!" Friday - Cardinal Spirit Day - "Get 'Red' of Drugs!" Students are encouraged to participate in the dress up days. We hope that the students have a fun with dress up days. On October 16th, the 7th and 8th grade Scholastics Teams travelled to Kimball for the first meet of the year. The 8th grade team took 6th place and the 7th grade team took 2nd. Congratulations to both teams on a strong performance. The Kimball meet is always early in the school year. The remaining meets will take place during the 2nd semester. School attendance and punctually are are always important and we appreciate our students' parents efforts to get their children to school every day on time. We ask for our students' parents continued support in getting our students to school on time during the testing window to ensure that they don't miss any more class time than is necessary. 7th grade students will have health screenings on October 16th. The screening includes: height, weight, BMI, blood pressure, vision, dental, and hearing. The health screenings are required by the state. 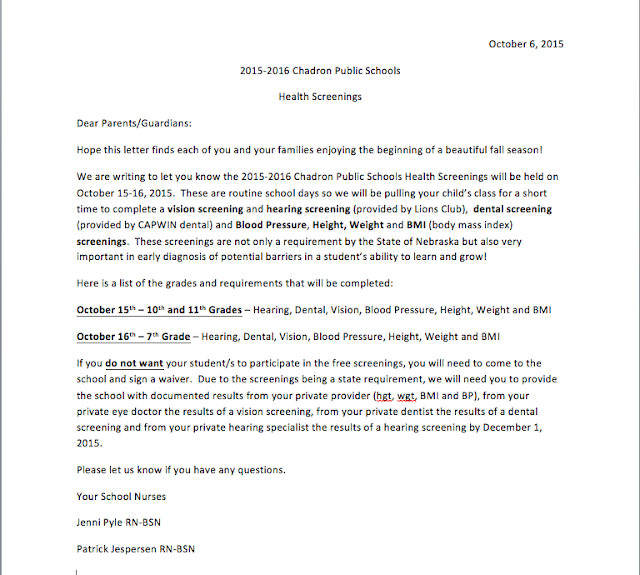 Please see the letter below from the school nurses for more information. If you have any questions please contact the middle school at 432-0708. On Saturday, October 3rd, a blustery and chilly fall day, students in Mrs. Mahr's 5th and 6th grade choir class performed three songs at the Chadron Fall Festival. The students did an excellent job! Thank you to all of the parents for brining your student(s) to the performance. We hope that the kids had a great time. The 5th-12 grade vocal music concert will take place on October 29th at 7 PM in the High School Auditorium. We are looking forward to some great performances! The week of October 5-9th will be the Pennies for the Pool campaign. We are asking children to participate by bringing their coins to school to help with the fundraising effort for the update to our City Pool. The pool will be an indoor year round facility with a water slide, splash pad, therapy pool and walking track. This event will run in conjunction with the local fundraising event for the Chadron Area Aquatics and Wellness Center. We would also ask the adults, parents, grandparents to go to the following website or Facebook page for more information on how you can help in the fundraising effort by making a donation or a pledge. The community goal is $500,000. http://chadronfoundation.org or on Facebook at Chadron Area Aquatics & Wellness. Below is some interesting information that compares Nebraska Public Schools to the rest of the United States. Nebraska public schools are out performing the rest of the nation on the NAPE, graduation rates, percent of students taking the ACT, ACT composite scores, average class sizes, and teachers with 20-years or more experience in the classroom. All of this data is good news for Nebraska students! Nebraska schools perform substantially better on NAEP than US average in both 8th grade reading and mathematics. Nebraska schools perform substantially better on NAEP than US average in both 4th grade reading and mathematics. Nebraska is just one of 13 states in our nation that showed significant gains in 4th grade math performance on NAEP from 2011 to 2013. Graduates: in Nebraska, nearly 90% or 89.7% of all students earned a high school diploma; the latest national figure show Nebraska beats the national high school grad rate by nearly 10%. (80% national average). College ready / College aspiring: 88% of Nebraska's seniors took the ACT. Nationally, just 59% did. Nebraska 2015 seniors' average ACT was a 21.7, eclipsing the National average of 21.0. In Nebraska, where a much higher percentage of seniors take the college-entrance exam, 43% of our seniors met all college-ready benchmarks on the ACT, while just 39% did nationally. Over 95% of Nebraska’s high school teachers are certified in the subject areas in which they teach. Nebraska schools average $11.5K in per pupil spending. The national average is $10.7K per pupil. 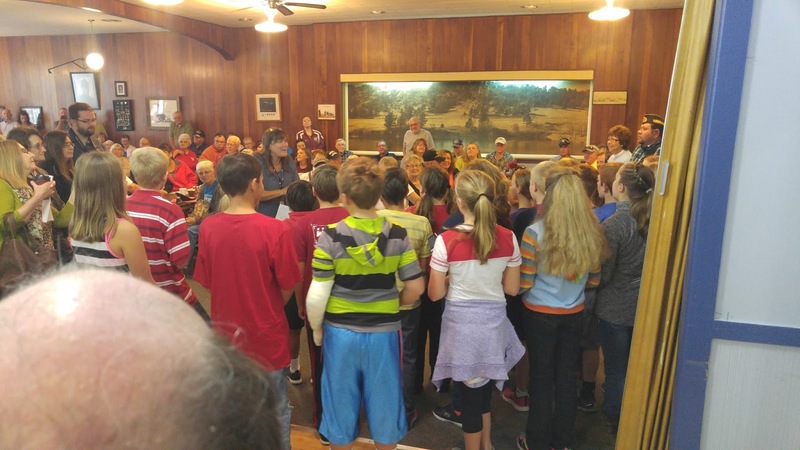 On September 24th, 5th grade students in Mrs. Dickerson's music class honored area veterans at the Honor Flight Send Off Celebration that was held at the American Legion in Chadron. 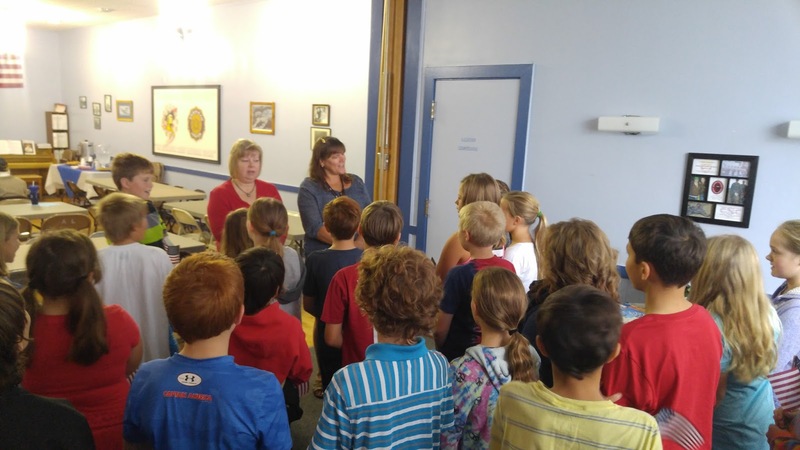 Students have been working hard in music class to prepare the three songs that they sang: "Nifty Fifity", "Our Nation", and "Proud of Our Veterans." Our students did a fantastic job singing the songs and they were very respectful throughout the ceremony. 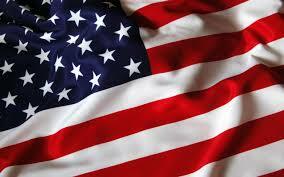 The students and staff at Chadron Middle School send our best wishes to the veterans and their guardians during their trip to Washington D.C. and would like to thank all veterans for their service to our great country. Students performing "Nifty Fifty" to a packed house! 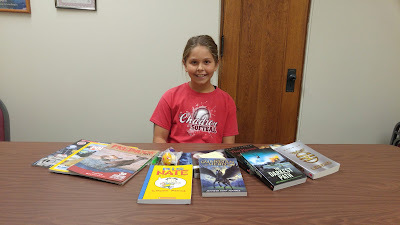 Congratulations to Jacey for winning $100 worth of books and prizes at the CMS Book Fair Raffle! On August 26th, members of the Nebraska Association of School Boards (NASB), visited Chadron Public Schools at the invitation of Dr. Winchester, Superintendent of Schools. The visiting members were eager to see some of the exciting and innovative things that are happening at Chadron Public School system. A few of the things that they took time to observe included: the Grab and Go breakfast program as CMS, the new boilers and chiller at CMS, the 1:1 iPads at CHS, and the Head Start program. Follow the link to see the write up that NASB did after the visit. Chadron Public Schools is proud of our students, staff, and programs and we were excited to share with NASB. We would like to thank the members of NASB for taking time out of their busy schedule to drop by check things out. Last Friday, September 11th, marked the 14th anniversary of the terrorist attacks on the World Trade Center in New York, the Pentagon in Washington D.C., and the hijacked United Airlines Flight 93 that crashed in a field near Shanksville, Pennsylvania . To honor the men and women that died on that tragic day, 150 of Mrs. Mahr's choir students honored America by singing "The Star Spangled Banner" on the CMS Stage. Thank you, kids for doing such a good job! In addition to the National Anthem, CMS had a moment of silence before the Pledge of Allegiance and many teachers and students discussed what happened on 9/11/2001 during class. On Friday, September 11th, 31 CMS 5th graders participated in the annual 5th Grade Fun Night. Students started the night with a scavenger hunt that is designed to help the 5th graders learn their way around the school. During the scavenger hunt, students work in teams of 3 and 4 to find things around the building. Following the scavenger hung, students participated in a "Clean Your Room" tournament. The game's objective is to move as much trash from your team's side of the floor to the other team's side. The team with the most least amount of trash on their side after 1-minute wins. Students came up with some pretty inventive ideas to clear their side of the floor quickly. Last, students worked in teams to unravel a saran wrap ball that contained prizes. The students really had to work to get the prized out this year. Prizes included a slinky, a light up ball, and lots of school supplies like mechanical pencils, highlighters, and erasers. Thank you to the CMS Student Council for organizing and running the activities. We hope that the kids had a blast! Chadron Middle School will host Parent-Teacher Conferences on Thursday, September 17th from 2:00-8:00 in the CMS Gym. CMS will have a 1:30 dismissal on that day to accommodate the conferences. Please note only the middle school has a 1:30 dismissal on that day. 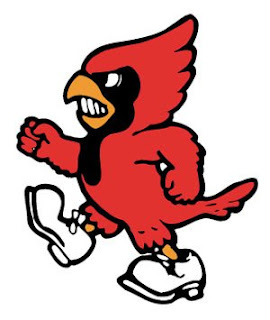 CMS, along with the rest of the district, will have a 1:30 dismissal on Friday, September 18th. Parent-Teacher Conferences correspond with the end of the mid-quarter, which means that there is only 4-weeks left in the 1st quarter. 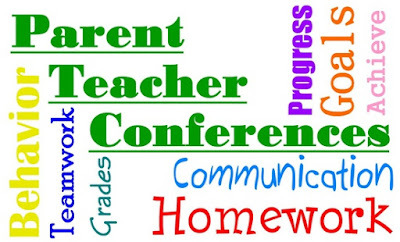 Having conferences at mid-quarter allows parents and teachers to communicate about student progress and discuss ways to ensure that students finish the quarter strong. 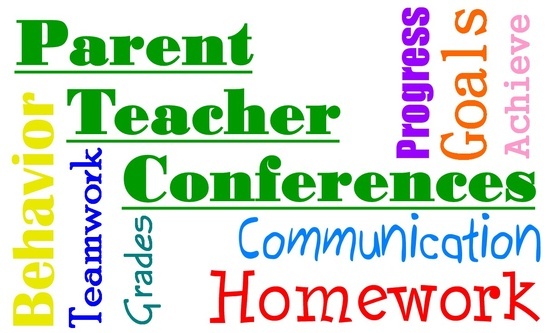 Parents are encouraged to bring their student(s) with them to conferences. If you have any questions, please call the CMS office at 432-0708 or email Mr. Dressel at nichlas.dressel@chadronschools.net. As Chadron's Superintendent of Schools and as President of the Chadron Board of Education, Dr.
Caroline Winchester and Mrs. Sandy Roes would like to invite you to participate in an upcoming Community Discussion designed to obtain stakeholder feedback. If you are new to the strategic planning process come see us. If you have been part of the process in the past, come see our progress. What points of pride, accomplishments, and achievements, has the district realized? What challenges will the district face in the next three to five years? We look forward to working with you on this initiative. Please contact the school district at 308-432-0700 to let us know if you will be able to join us in this exciting opportunity to assist in shaping the future of Chadron Public Schools. Working together, we can strengthen our student's learning experience and success. On behalf of the students of our community, we appreciate your contribution to this and other school support initiatives. We are pleased to announce the results of Chadron Middle School's 2015 NeSA results. CMS students scored very well on all four subject tests: Reading, Math, Science, and Writing. Highlights include: increased 5th grade reading scores for the second year in a row, 6th and 8th grade reading scores that exceed state averages, strong math scores, and science and writing scores that exceed state averages. Information about NeSA: Students across the state of Nebraska take the NeSA in grades 3,4, 5-8, and 11. At Chadron Middle School, all students are tested in reading, and math. 5th and 8th grade students are tested in science and only 8th graders take the writing test. 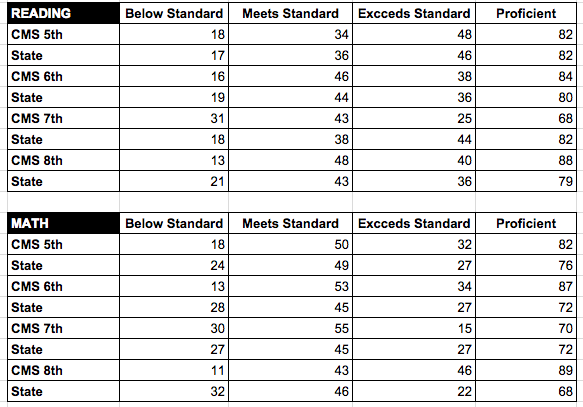 Scoring categories include Below Standard, Meets Standard, and Exceeds Standard. 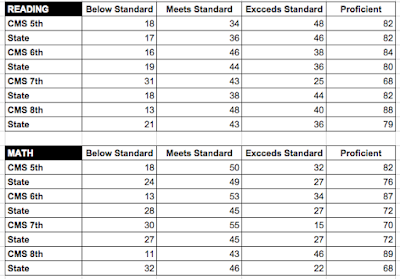 Overall proficiency is calculated by combining Meets standards and Exceeds Standard scores. We are proud of our students and teachers for the hard work that did last year and we are excited for all of the learning that will take place this year. On August 25th, Chadron Middle School celebrated the official grand opening of its new playground with students, parents and friends. Students participated in a ribbon cutting ceremony with the Chadron Chamber of Commerce and then enjoyed hotdogs, chips, and drinks before taking their parents into the school to show them around and meet teachers. The opening of the playground comes after a year and a half of fundraising efforts through which over $15,000 was raised. The funds were used to pour a concrete basketball court and install a fence around the play area. The improvements that were made make up the first of three phases of the project. Future plans include pouring more concrete, installing a shade structure with tables and benches, and an underground sprinkler system. A special thanks goes out to all of the partners that helped with the fundraising efforts. These partners include: Walstrom Ford, Morford's Decorating, Chadron Kiwanis Club, Chadron Rotary, SDS Construction, Main Street Dental, The Chadron Ladies Golf Association, Three Girls' Produce, Chadron Middle School Student Council, Classics in the Park Car Club, and countless parents, students, and friends. Thank you to everyone that attended the event and for making it a very special night!